View air quality data by region in Illinois. View the air quality forecasts for all sectors in Illinois. View the latest Annual Air Quality Report from the Illinois EPA. Visit the Illinois EPA's website. Welcome to the Illinois EnviroFlash system! When we breathe, we take in more than just air. On some days, there may be elevated levels of air pollution, specifically ozone and particulate matter, which changes the outdoor air quality. Just like the weather, our air quality is forecasted every day. 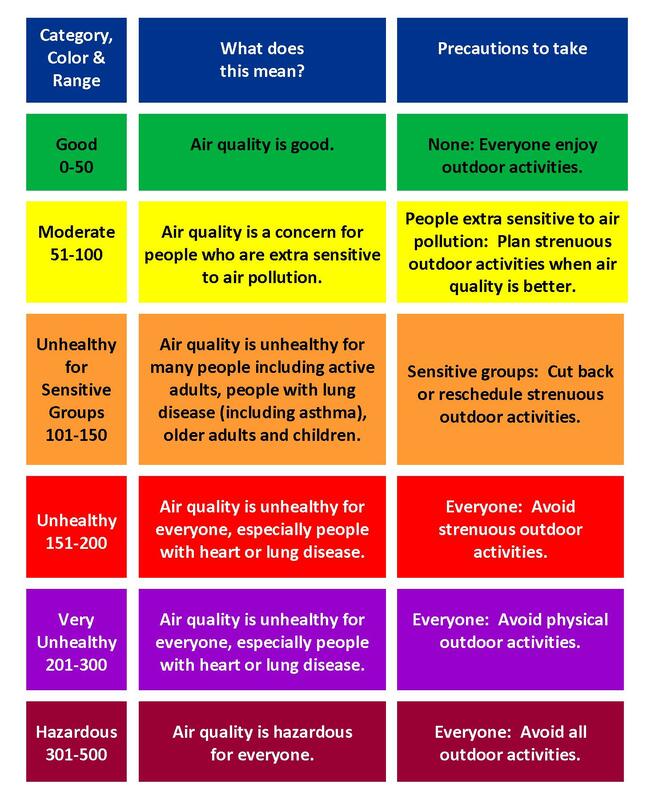 The daily air quaity is assigned a category with a corresponding color. Also, there are actions we should take for each category. To view the Air Quality Index, click here. When there is more air pollution in the air, this puts all of us - especially the elderly, children, people with heart and lung disease and those who exercise outdoors - at risk. But we can change that by taking actions to help improve air quality! Take action now and start making a difference in your community. The following is a list of some actions we can take at home to improve air quailty locally. Take public transit, Rideshare, walk or bike. If driving, avoid idling, consolidate errands and run them after 7 p.m. when sunlight is not as strong. Set your thermostat up at least 2 degrees and use a programmable thermostat. Turn off and unplug electronics not in use. Use environmentally friendly household and cleaning products. Use a charcoal chimney or gas grill instead of lighter fluid when grilling. Avoid using gasoline-powered equipment on Air Pollution Action Days. Do not burn leaves and other yard waste. Notify colleagues, friends and family to help protect their health and encourage actions. Sign-up to receive your air quality forecast via email at http://illinois.enviroflash.info.